American persimmons grow wild over a large part of the southeastern and south central U.S. from USDA plant hardiness zone five to nine. The fruit quality falls short of the standard set by the Japanese persimmon, a less hardy tree first imported to the U.S. in 1852. The Japanese persimmon survives winter lows of 10 degrees F, which limits its range to USDA zones seven to 10. Scions of wood taken from Japanese stock survive much colder weather when grafted to American persimmons. Growers may succeed even as far north as southern Indiana. 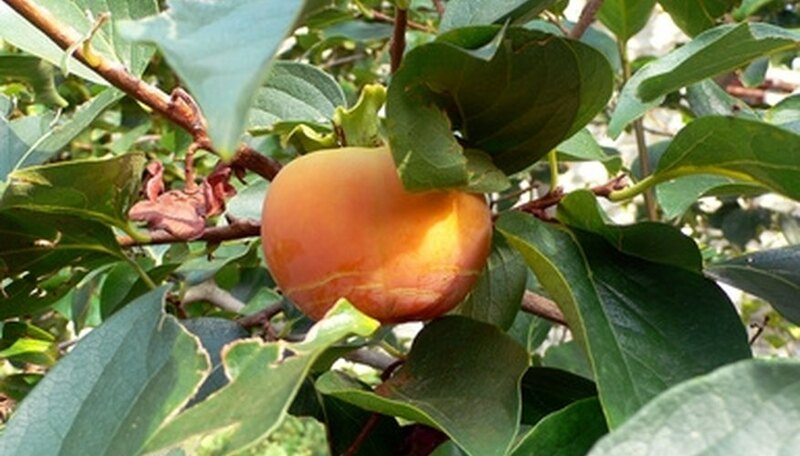 Top-graft persimmon trees with central trunks or side branches between 1 1/2 inches and 3 1/2 inches in diameter. Graft in early spring just before buds open. Cut the top of the tree straight across with the pruning saw. Cut above two healthy lower limbs to nurse the tree while the graft grows. Graft to the top or to a strong side branch of the proper diameter. Select a section of scion--a cutting taken from the desired variety of persimmon--with at least three buds. Cut to the center of the scion at a 45 degree angle beginning 1/2 inch below the first bud. Cut a straight flat section to the end of the scion's base and trim back to 1 1/2 inches. Trim the back of the scion to a flat chisel tip beginning 1/2 inch from the base. Shave enough rough bark away from the south side of the host stump to expose a two-inch-long section of flexible living bark, wide enough to match the scion. Place the cut side of the scion against the shaved section of bark and slit the bark on either side with the grafting knife. Slip the scion under the bark strip. Mate the flat section of scion to the sapwood of the host. Cut the bark strip straight across, leaving a 3/4-inch bark flap. Tack the scion in place with one brad through the bark flap and scion and one brad a half inch above the bark flap, through the center of the scion. Cut a two-inch square of aluminum foil and slit one side to the center. Slide the foil around the scion's base and crimp into place, fully covering the graft. Cut a larger foil piece to cover the stump and graft and wrap all exposed cuts. Cut a small slit in the bottom of a clear polyethylene bag. Pull the bag down carefully over the scion. Seal the bag below the first bud with a rubber band. Wrap the lower part of the bag below the graft with black electrical tape. Coat the exposed tip of the scion with white glue. Cut away plastic and foil when new growth reaches six inches in length. Trim new growth back to two feet the first year to avoid wind damage. After two years prune off all branches below the successful graft to force all the tree's growth into the established scion.